Jody is a true role model and trailblazer for women everywhere – the first women’s hoops coach to reach 700 collegiate victories, lead a team through an undefeated season to a victory at the NCAA national championship, and be inducted into the Naismith Memorial Basketball Hall of Fame. Jody Conradt is a true role model and trailblazer for leaders and women everywhere. She is also the first women’s basketball coach to lead their team through an undefeated season to a victory at the NCAA national championship. She has achieved a 99 percent graduation rate for her team players and is the first women’s basketball coach to be inducted into the Naismith Memorial Basketball Hall of Fame. She encourages her players to pursue greatness both on and off the court, an endeavor well-represented by the 99 percent graduation rate among her team players and the numerous motivational and educational programs she has driven throughout her career. 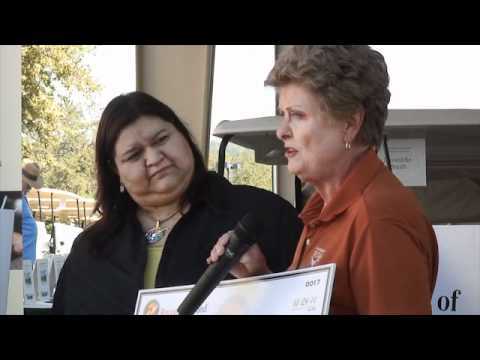 Jody gave her “Pay-It-Forward” check to the Neighborhood Longhorns Program, which is dedicated to improving overall academic performance, providing educational incentives, and giving students opportunities for higher education scholarships.